Stuck at home because of the storm? Why not save some money on your auto insurance by taking the Defensive Driving by the Improv Club. Its Fast - Fun - and DONE! If you are a Star Wars fan you'll get the humor of this photo! 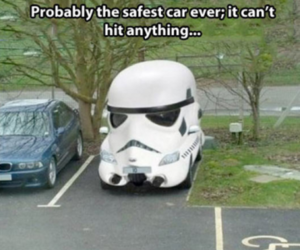 Storm Troopers don't really seem to hit anything. This is the type of funny, quirky quips you'll find imbedded in this entertaining way to take a defensive driving course. • Proof of Completion within 30 min. Note: some restrictions apply so check their website for more details. This course can also be used for point reduction. For fellow NYers - The DMV will reduce four (4) points off your driving record. If you have no points on your driver’s record, you will still benefit from insurance reduction New York law requires that any insurance company offer you a minimum 10% discount in the base rate of your auto or motorcycle liability and collision coverage over 3 years upon a completion of a New York DMV- approved Defensive Driving Course. Certified by State of New York for our New York Defensive Driving School online. View certification. Check their website for the other states where this course is approved. According to their representative "We offer a defensive driving course but we are not approved by Connecticut. You can ask your insurance agent if they are willing to accept our online certificate." Their course may possibly be accepted for point reduction but you should check with the court.